Their maker is Carol Windsor, a jewelry artist from California. 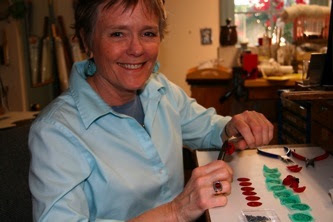 Crafting since childhood in her father's garage studio, Carol began creating jewelry while in high school and went on to study design and art history in college. Originally metal, wood, and enamel were her chosen materials. The transition to paper evolved from her enjoyment of creating large tissue paper flowers for parties, as well as the change in life circumstances that occurred when her children grew and left home. Consequently Carol says she felt light, free, and more aware of the fleeting nature of life, and wanted to express those feelings through her art. She developed a process of laminating sterling silver between layers of very thin paper. 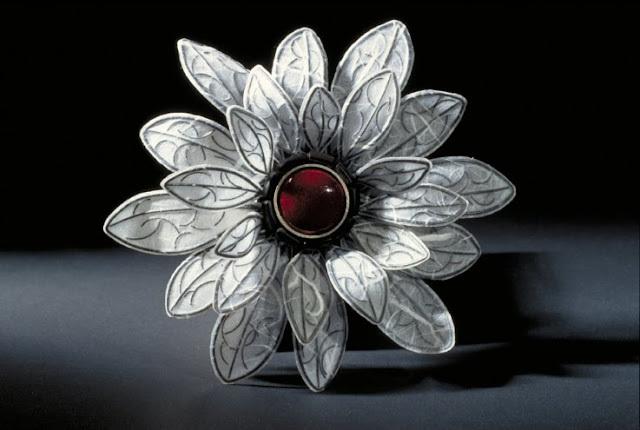 Carol forms a petal shape with sterling silver wire and makes thin interior wires that will show through the translucent paper, resembling veins in a leaf. She does this by coiling wire around steel mandrels, oxidizes the wire, and then cuts the coils into small segments. Next she lays the frame on a small square of paper and adds the tiny, curved wire segments. Another layer of paper goes on top; it's saturated with glue, and carefully picked up and hung to dry. Some petals have additional layers of paper for deeper color. When dry, the paper is trimmed close to the framework and sprayed with an acrylic fixative. 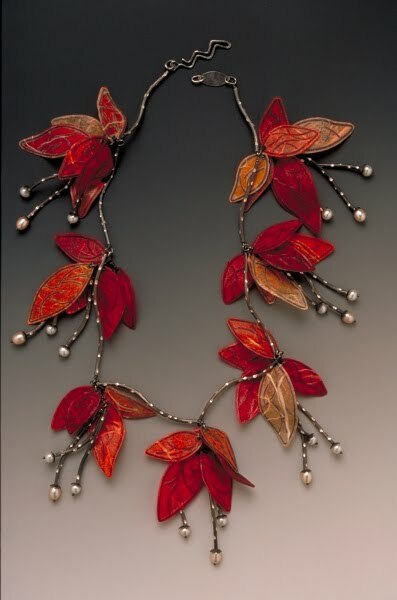 Carol then shapes the petals and suspends them from silver "twigs" and earring posts, or fashions them into dramatic necklaces and brooches. 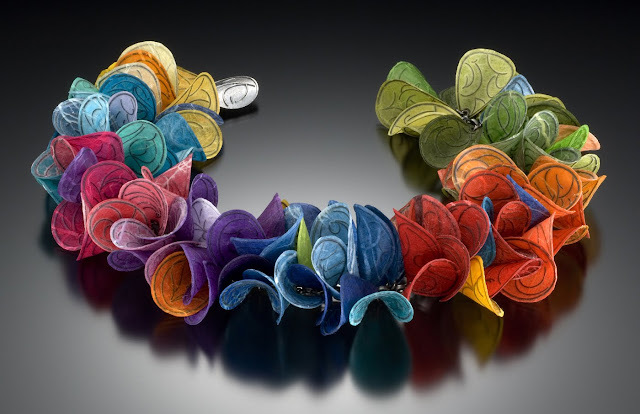 Carol's work has been exhibited in galleries across the U.S. and in Europe, at juried art fairs, and is featured in books and periodicals. Those earrings are AMAZING!!! i would buy them up in a heartbeat if I wasn't a starving broke grad student seriously in the hole because of trying to start my own company. 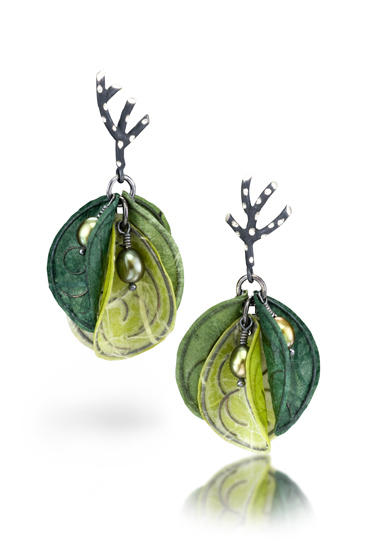 But seriously, I'm pining away for some of those earrings. Thanks for posting about them!! !